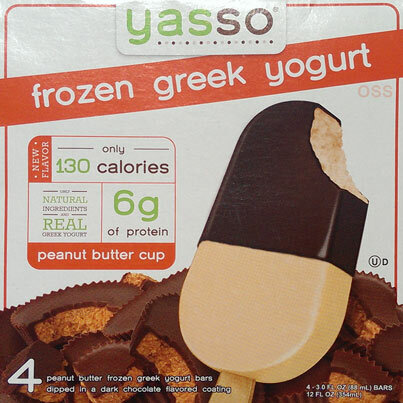 [New for 2014] I've been meaning to get Yasso on the blog for awhile now, but you guys know I always fear the Greek yogurt tang. Well, after the peanut butter enlightened review, you said I needed to try the new Yasso peanut butter bar, so, here we go! Woohoo! Someone listened and actually labeled the wrapper! Very nice. Doh! Chocolate Shell Fail! Hopefully they aren't all like that. I tried to grab the bigger pieces of the thin shell and they aren't bad, not bad at all. I take my first few savory moments with the bar and it's not bad, not bad at all. I definitely dig the chocolate coating that is livening things up a bit. The shell is fairly thin, and not crazy dry or anything, so it's accenting the peanut butter flavor rather than trying to dominate it. I work my way past the shell and leave myself with is what effectively a peanut butter pudding pop, and I don't have any major complaints. My fear of greek yogurt tang was for nothing (though it may show up in other flavors). I'm also glad that these are thinner then the enlightened bars as it encourages savoring instead of chomping. Me being me, obviously I want the chocolate shell to go all the way to the bottom. There's just something a bit monotonous about the plain peanut butter flavor for me. However, that's just me wanting my stereotypical, strong, salty peanut butter flavoring rather then this more mellow version. Oh, one final question: They have a new chocolate fudge bar and a new peanut butter bar, why not mix the flavors for a true chocolate peanut butter flavor? Maybe next year. Verdict? Not bad at all! I asked you to review this after you reviewed the peanut butter Enlightened Bar and you said that you're not sure you saw this flavor (check back at that entry from July 17th if you don't remember). I guess you found it! Thanks for reviewing this! Yeah, I was at Roche Bros. They are usually a bit behind, but they seemed to have fresh stock including this one. The salted caramel ones are great! After the anonymous comment, I decided to try the Sea Salted Caramel Yasso Bars. Do yourself a favor and buy them because you will not be disappointed. They are one of the best caramel frozen treats I have ever tasted. Yasso came out with pints...will you try them?